On this week’s “Brooklyn Nine-Nine,” Jake and Amy reverted back to their competitive old ways during a precinct tradition while Captain Holt and Terry went head-to-head with Deputy Chief Wuntch. Thanks to the three-hour delay of the Serbian President’s visit, the entire precinct is left to their own devices while Holt and Terry meet with Wuntch to get funding for new narcotics field kits. Jake immediately declares that they’re going to play “The Jimmy Jab Games”, which are basically just a series of ridiculous contests Jake came up with years ago that take place in the absence of supervision. This time the prize is a fancy chair free of mildew and stains and, for Jake, the phone number of Rosa’s cute friend. However, Amy is determined to win for the first time ever and refuses to back down. Meanwhile, Boyle is being blackmailed by a very surprising mastermind: Hitchcock. Boyle, in an effort to perfect his workout routine, began filming himself exercising. However, he lost one of the tapes with incriminating evidence of his and Gina’s affair, and Hitchcock has it. Hitchcock agrees to give it back only if Boyle helps “make him cool in everybody’s eyes.” Boyle argues that this is virtually impossible, but he agrees nonetheless. The Jimmy Jab Games go exactly as expected – they make a huge mess and Scully gets food poisoning. The first event was a month-old Chinese food eating contest, effectively eliminating Boyle, whose foodie side can’t handle it. The second event, the bomb-suit race, eliminates Hitchcock, whose preoccupation with being cool distracts him from the race. The third event involves Rosa, Amy and Jake going undercover and seeing how many cops they can fool. Rosa’s frustration gets the best of her, leaving Jake and Amy to battle it out in the final event. Rosa, noticing the constant flirtation between the two, confronts Jake and says that she’ll only give him her friend’s number if he agrees to stop flirting with Amy since he’s supposedly over her, resulting in Jake acting like a complete weirdo around her for the rest of the games. During all this, Holt and Terry are battling Wuntch for resources to deal with a new kind of ecstasy that’s on the rise. Wuntch won’t budge and sends them away after noticing a strategically placed typo in their proposal, allowing Holt to go over her head to her superior and obtain funding and a task force to combat the drug. Wuntch claims that Holt is wasting force resources, putting an immense amount of pressure on the precinct to make impressive arrests. The final event is an intense obstacle course that ends with Amy winning and Holt and Terry returning to a precinct covered in fire extinguisher foam. Jake later reveals to Rosa that he let Amy win because he still has feelings for her and he doesn’t know what to do about it. She takes pity on him and gives him her friends number, claiming she’s never seen him this hung up on someone and he needs to move on whether he’s ready to or not. 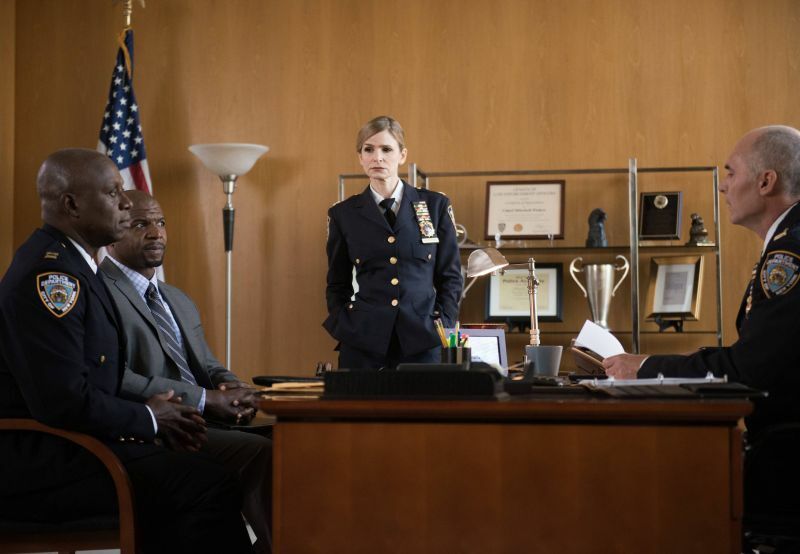 In the end, order is somewhat restored as Holt and Terry make the executive decision to put Rosa in charge of the task force and Jake decides it’s time for him to move on from Amy. Most importantly, Boyle gets his tape back from Hitchcock after physically fighting him and destroys it, along with all evidence that he’s involved with Gina in any way.